So now we know why Leona Maguire told GB and I team captain Elaine Farquharson-Black that she would not be available for the Curtis Cup match against United States at Quaker Ridge Golf Club in New York State from June 8 to 10. Leona - and twin sister Lisa - will be making their pro debuts not all that far away from Quaker Ridge - in New Jersey, in fact - in the LPGA Shoprite Classic on the same June 8 to 10 dates as the 40th Curtis Cup match. Leona Maguire, a two-time WGCA and ANNIKA National Player of the Year, became just the second three-time ACC Champion with the Blue Devils in April. She owns the most weeks ranked No. 1 in the Women’s Amateur Golf Ranking and is a three-time winner of the Mark H. McCormick Medal. Maguire competed in the Curtis Cup on three occasions and won the 2017 Ladies’ British Open Amateur Championship. She concluded her collegiate career with 10 victories and a school-record 87 rounds of even or under par. Lisa Maguire has been ranked as high as 35th in the World Amateur Golf Rankings and is a winner of the Great Britain and Ireland Women’s Order of Merit. She is a two-time member of the European Junior Solheim Cup team, played on the Curtis Cup squad in 2010, and was the 2011 European Ladies Amateur and Spanish Ladies Amateur champion. The Maguires join an impressive list of LPGA stars that have launched their careers at the ShopRite LPGA Classic Presented by Acer, including Paula Creamer, Lexi Thompson and Brooke Henderson. 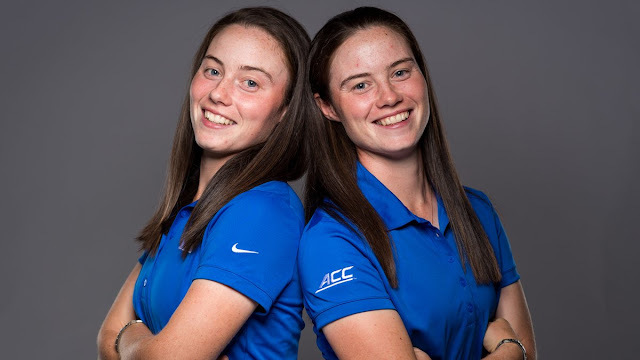 Over the last four years, the twins have helped lead Duke University women's team to three appearances in the NCAA Championship match play, two ACC Championships and to a total of 14 victories. For more information on the ShopRite Classic visit www.shopritelpgaclassic.com. Fans will be able to follow the action via the Golf Channel on June 8 from 1:30-3:30 p.m., June 9 from 3-5 p.m., and June 10 from 3-5 p.m.